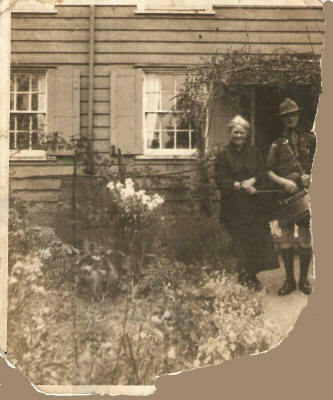 This is my Dad aged about 14 - 15 with his Mum outside Back Cottage, Shoulder Hall, Gustard Wood. Miss Olivia Robins ran three Scout Troops I believe, Wheathampstead, the Folly and the one Dad belonged to, Gustard Wood. Dad was proud that he went camping at the big Scout Jambouree at Wembley. This was during the 1925 Exhibition. he met scouts from all over the world. He often spoke of it. The German scouts were very inventive and actually fixed running water in pipes.